Predecessor to the Pro Bowl, the NFL’s all-star contest that came into being after the 1950 NFL season, was the Pro All-Star Game, which followed the 1938 thru ’42 seasons. Unlike the Pro Bowl, the Pro All-Star Game format matched the winner of the NFL Championship game against a squad of All-Stars representing the rest of the league. The second game was played on January 14, 1940 and featured the Green Bay Packers, NFL Champions of 1939, against an All-Star team coached by Steve Owen of the Giants. The Packers, coached by Curly Lambeau, had gone 9-2 in winning the Western Division for the second straight year and handily defeated the Giants by a score of 27-0 in a Championship game rematch. 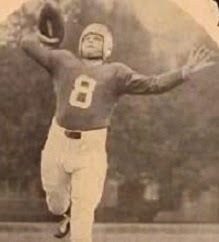 Tailbacks Arnie Herber and Cecil Isbell (pictured above) were fine passers and they had the league’s best receiver in end Don Hutson as primary target. Behind an outstanding line, FB Clarke Hinkle led the running attack. Among the players in the starting lineup for the All-Stars were center Mel Hein and end Jim Poole of the Giants, HB Parker Hall (the league MVP) and FB Johnny Drake of the Rams, Brooklyn end Perry Schwartz and guard Bruiser Kinard, and tackle Joe Stydahar of the Bears. The game, played in Los Angeles, had been postponed a week due to rain and there was a near-capacity crowd of 18,000 in attendance under sunny skies at Gilmore Stadium. The All-Stars had worked together for three weeks and lacked coordination, neither running nor passing the ball effectively. The Packers struck first in the opening quarter with Clarke Hinkle kicking a 45-yard field goal. In the second quarter, Green Bay drove to the All-Star 11 and Ernie Smith booted an 18-yard field goal that made the score 6-0. 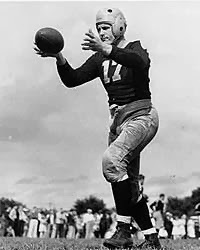 The All-Stars threatened later in the period when Washington tailback Frank Filchock threw to end Bill Smith of the Cardinals for a 62-yard gain to the Green Bay 12, where he was knocked out of bounds by Cecil Isbell. The Packers held for three downs and a fourth down pass by Filchock was intercepted by LB Ed Jankowski to end the threat. With the ball at their eight yard line and the clock down to 38 seconds in the first half, the Packers pulled off the most spectacular play of the game. 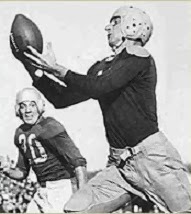 The All-Stars were anticipating a punt, but Isbell instead faded back into his end zone and threw long for Don Hutson (pictured at left). The pass went over 60 yards in the air before being gathered in by the streaking Hutson, who went the distance for a 92-yard touchdown. Smith kicked the extra point and the NFL champs took a 13-0 lead into halftime. Early in the third quarter, the All-Stars got moving on offense, under the direction of diminutive QB Davey O’Brien of the Eagles. First, O’Brien gave the All-Stars good field position as he returned a punt 28 yards to the Green Bay 17. Two runs by Johnny Drake gave the All-Stars a first down at the six, and two plays later O’Brien threw to end Joe Carter, an Eagles teammate, in the end zone for a touchdown. Ward Cuff of the Giants added the extra point and the All-Stars were back in the game at 13-7. Later in the period, runs of 24 yards by Hinkle and 19 yards by HB Andy Uram helped the Packers to reach the All-Star 16. The drive stalled, but Smith added a seven-yard field goal to put Green Bay ahead by nine. That was it for the scoring, although late in the contest the Packers reached the All-Star three yard line thanks to passes by Arnie Herber to Hutson and end Carl “Moose” Mulleneaux. On fourth down, and having lost a yard, Ernie Smith lined up for a field goal attempt, but with the crowd shouting for a touchdown, the Packers tried a pass instead that fell incomplete. It was of no consequence as Green Bay came away the winner by a final score of 16-7. The game ended with the ball near midfield after O’Brien fired a pass to Bill Smith for a 25-yard gain. The Packers easily outgained the All-Stars (330 yards to 130) and had the edge in first downs (11 to 8). Each team gave up two interceptions apiece. Davey O’Brien (pictured at right), Johnny Drake, and Parker Hall were the best of the backs for the All-Stars. The win for the Packers gave the NFL champs a second win over the All-Stars in as many games. It would reach four straight before the All-Stars would win the fifth, and final, contest of the series.